A good few years ago, I played a good few rounds of golf here — some of them on absolutely beautiful courses too. And, it has to be said that waywardly whacking a ball round meticulously maintained holes, with mountains in the background and caddy-san careering about in a cart with everyone’s clubs, really was a treat. However, the trouble is, actually getting to that hitting a ball stage can be a real hassle. For starters, there’s finding a course that’s affordable in the first place. Then harder still is trying to find a vacant time slot. Plus, even if one is eventually fortunate enough to get a date sometime in the not too distant future, it’ll still be an incredibly early and random tee-off time: 7:46 maybe, or a slightly luckier 8:11. A time that must, under all circumstances, be adhered to. The prospect of missing it, even by a minute, apparently jeopardising the whole fabric of time. Either that or a severe telling off from caddy-san. The latter of which, without a doubt, is the more worrying. All of which, needless to say, takes some of the shine off going, making it nowhere near as relaxing as it should be. Totally unlike the time this fella in Kawasaki is enjoying. Yes, there are no holes. Plus the backdrop is far from beautiful. But he has space. All the time he could ever wish for. And the biggest water hazard in the whole wide world. Definitely seems much more relaxing than the scenario you describe. I’m fortunate enough that my giri otoo-san belongs to a couple private clubs. This is the only way to go, though we do usually end up with first of the morning tee times (his preference). I do like being able to have a bowl of noodles and a beer at the turn, however, without incurring the wrath of a marshall. The game is definitely more leisurely in Japan than it is in North America. Yes, that is the way to go. Even more so if the clubs are fairly near. We always ended having to travel a long way too. I think I’m spoiled by the fact that when I go back home in the summer, we drive 10 minutes to where my Dad plays, I pay a small fee, and then we just head out and play as many holes as we want. He has good form at the top, he must practice often. 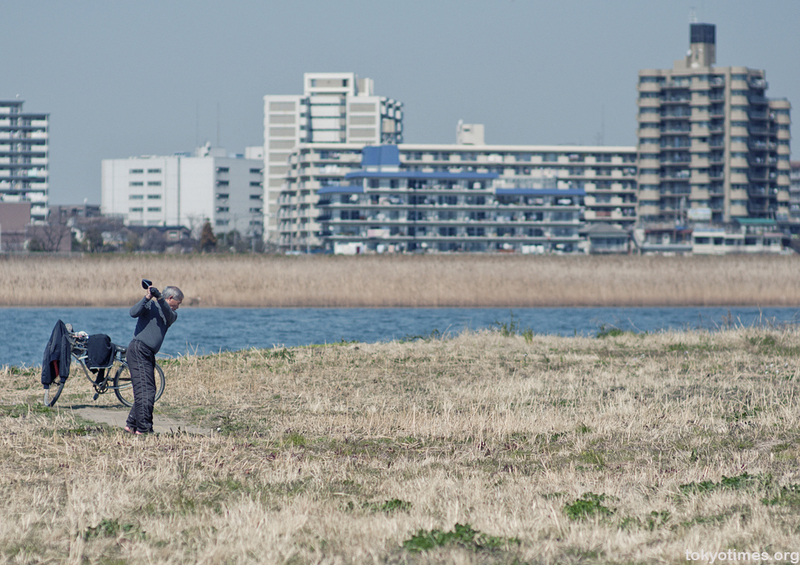 My Japan golf experience is limited but it is certainly far different than golfing in the US. More pleasureable by far. Yeah, he had a pretty good swing. My guess is he’s there on a regular basis. As I mentioned to Jeffrey above, my only other experience is in Britain, which, by the sound of it, is obviously more relaxed than in other parts of the world.